Protectors of the spirit of the earth and Nature itself, the Earth dragons are the largest of the dragons. However, they are gentle giants, taking their time and loving the earth itself. Due to their immortality, Earth dragons love to sit and watch the years pass in the blink of an eye, sometimes remaining in one place long enough to be mistaken for a hill. 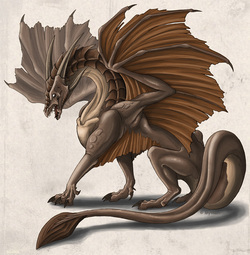 In fact, an ancient tale told by Nire the Bard tells of a city that was built within a sleeping Earth Dragon. However, the power of an Earth Dragon does come at a cost. Simple spells are twice as hard for them, and they have trouble performing even the simplest of spells at low levels.